By the guidance of the Lord, Unique Prayer Meetings in the name of ANBARIN PATHATHIL ORU NAAL (FASTING PRAYER) (A DAY AT THE FEET OF THE LORD) AND AARUTHALAI THEDI ORU NAAL (A DAY IN SEARCH OF COMFORT) was started. It was started in a humble manner and now God has blessed it in a such way that people from all over India and from different parts of the world come to attend these meetings. Bro. Stephen waits at the feet of the Lord for days together in fasting to get a word from the Lord. God fills him with His anointing and this anointing delivers the people from their bondages. Every month, there is an over flow of crowd in these meetings. At the end of the fasting prayer, food is served to the people who go back to their homes satisfied both spiritually and physically. 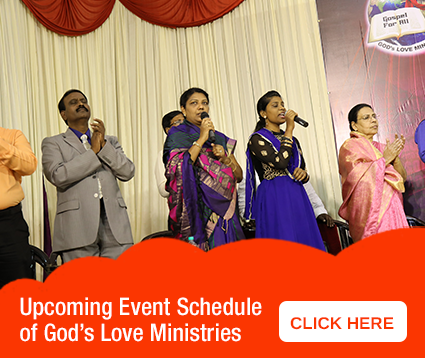 These meetings are primarily conducted in Chennai and God has given Bro.Stephen the vision to start the ANBARIN PATHATHIL ORU NAAL AND AARUTHALAI THEDI ORU NAAL meetings in different parts of India and Abroad. Apart from these events, God is taking Bro.Stephen to different parts of the world to share the message of love and deliver the people from the clutches of the evil. Throughout the year, Bro.Stephen is on travel carrying the gospel across Nations. The expense to conduct an event is huge. Expenses are incurred from the publicity, ground or auditorium hiring, charges for the stage, lighting, and PA systems, Chairs , food served to the people , man power etc. Your sponsorship will go a long way to reach the unreached and preach the gospel to all. You can donate as lead by God. Click to donate online. A Special Wedding Anniversary card & Birthday card will be sent on your birthday & Wedding Anniversary. Prayer Intercessors will call and pray on your Birthday & Wedding Anniversary.